Pharmacy Compounding is a vital aspect of healthcare today. It is the mixing of active pharmaceutical ingredients to meet the unique needs of an individual patient; whether that patient is a human or an animal. While compounding has always been a basic part of pharmacy practice, today it is an area that has rapidly evolved. Compounding allows the specially trained pharmacist and technician to use their science and mathematics background more than in other pharmacy practice settings. Because compounding meets individualized needs of patients, pharmacists and other staff members develop a close relationship with medical professionals, caregivers and the patients they serve. They work closely with doctors, advanced practice nurses, physician assistants, veterinarians, and others with prescriptive authority to solve problems that are not addressed by commercially available dosage forms. Practitioners sometimes need to prescribe individually compounded medications for a patient with special healthcare needs. It may be simply changing the dosage form from a solid pill to a liquid because a patient is unable to swallow a tablet or capsule due to age or because of a disability. For example, patients with a feeding tube must have their medications liquefied. Having the medication compounded from the pure chemical results in a product that is free from extraneous ingredients contained in a tablet or capsule that can potentially clog the tube. This may mean the patient is not getting his or her full dose, or worse, the patient may have to change the tube more often. Preparing a liquid offers the needed flexibility in dosing for the patient requiring a much lower dose than is available. This is often seen when treating infants and small children who have serious health issues usually seen in adults. In these cases there is no pediatric dose or dosage form commercially available. The ability to prepare medications free from substances that cause negative effects is extremely helpful to patients with special dietary needs. Some of these include dietary needs for those who are gluten or lactose intolerant, and the needs of those with challenging conditions ranging from autism to celiac disease. Patients with allergies or sensitivities to certain substances can have their medicines custom-made without the offending ingredients. This can be extremely beneficial for those who cannot tolerate artificial dyes, preservatives, nuts, artificial sweeteners, artificial flavors, sugar, gluten, wheat, corn, etc. Some medications have been discontinued by the manufacturer due to low profitability or because a newer drug has taken its place. A compounding pharmacy can duplicate these medications allowing patients who still need them to continue with effective therapies. Hospice patients especially benefit from compounding by having access to alternate dosage forms such as lollipops, topical transdermal gels, or suppositories as they lose the ability to swallow pills or liquids. This gives one the ability to treat their pain, agitation, anxiety, or nausea with greater effectiveness. Being able to treat these symptoms more easily helps the patient as well as the caregiver. Compounding has proven to be an invaluable service for the veterinary community. Animal doses are based on weight so there is a need for multiple strengths of the drugs that are prescribed for them. 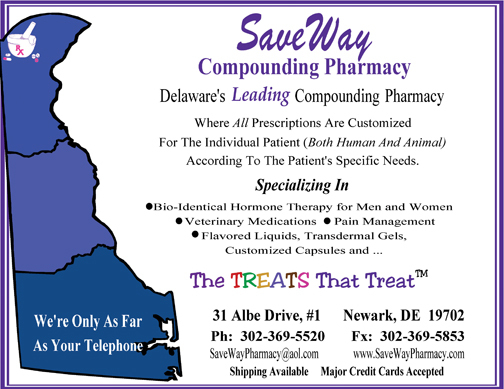 In addition, a compounding pharmacy can concoct the medications in dosage forms that make dosing easier for both the pet and the owner resulting in better compliancy. Some of the options include flavored liquids, chewable treats, capsules, topically applied and systemically absorbed transdermal gels, or suppositories. Having all these options allows the pets’ prescription to be prepared in a form and flavor that best suits the animal’s preference. Compounding also provides the ability to combine several medications into a single dosage allowing for fewer doses. This can mean less stress for both the animal and the owner. For animals in a fragile health state this can improve their quality of life and potentially add time to their lifespan. Pharmacy compounding has often been described as an art form. As with any creative endeavor, it is imperative that the preparer pay close attention to detail. A qualified compounder will have extensive training enabling him/her to advise and offer viable solutions to medication problems. The role of the compounding pharmacist has come full circle and returned to the roots of pharmacy. Meeting the unique needs of individual patients with carefully prepared individualized medications offers benefits that positively affect all that are treated, regardless of species.